After a prolonged break of burger-interval, I’m back with an amazing burger post! As you might have noticed by this stage, I’ve tried a variety of burgers – not all, but a decent amount, if you will. So, when I head to someplace new, I’m always anticipating something more interesting and perhaps, a little different. I’m giving Nom Nom Chomper an exception. If I were to handpick a few burger joints to recommend in town, this is definitely one of them. Personal preference aside, this place carries a range of classics and predictable burgers. So, if you are looking for something boring but amazing, this write up is for you. Ramblings afar, I have to tell you about this stunning burger. Like many standalone restaurants, the location of Nom Nom Chomper is not strategically ideal. In other words, customers would need to come just for the burgers as there’s essentially nothing else nearby. That said, look at how triumphant My Burger Lab is doing. This is my fifth, faithful attempt on visiting Nom2. In my previous ill-fated tries, it’s either not open, closed for private events and well, I got lost the first time looking, so I gave up. That count too right? Also to note, the place is closed on Saturdays – sadly. IMHO, I would think that it’s one massive opportunity loss, to close on the day where everyone wants to eat out and stay out late. There is no fixed theme for the restaurant – superhero come comic inspired canvas blocks, posh leather seats, simple wooden tables and plain yellow walls. I am confused, are you confused? After all, I’m here, primarily for the food. Nom Nom Chomper is also known for it’s Homemade buns – in sesame whites and charcoal. Conversely, homemade versions are fast becoming a fad now. Their versions have fluffy, toothsome textures that brought about temptations of me, buying a dozen burger buns back later. However, if not refrigerated and defrosted properly, you may end up with one crusty burger – more of that later in this post. You can by the way, purchase the buns to bring home at Rm3 each. Let us now proceed with the menu. At hindsight, I figured prices are reasonably cheaper compared to some other burger joints in town since prices include a small portion of fries and garden salad as well. Besides the conventional burgers, there are also a variety of Pastas and Mains offered on their menu. My friend, who previously gave their pastas a try, gave them double thumbs up. I shall give that a go some other time for sure. Not knowing what to order, I simply asked for recommendation – Nom2 Rich Texan Barbequed B, Juicy Lucy were high on their list. Since there was only 2 of us, we ordered one of each to share. If you are looking for a non-complicated, no-fuss, classic burger – this is it. The 200gm of dense beef patty had a nice bouncy, firm and dense texture. Now – come to think of it, perhaps it was a little too rubbery for many but I’m not complaining, I like my burgers this way, for a good change. The burger also had a light punch of peppery flavor and had mozzarella and cheddar cheese oozing all over. The burger buns are quite thick, do get a napkin ready if you’re about to stuff-a-bite into your mouth. If my burgers are served neatly on a plate, I would usually just stick to my ladylike way – to use a fork and knife. Boo. Nom2 Rich Texan Barbequed B. Rm13.90. The 200gm beef patty grilled with BBQ sauce had the perfect thickness, housed within a refreshingly large but that exudes harmonious flavors that had me going back for more. The barbeque sauce and mustard on top added a little sweetness and tang to crispness of the burger. It really didn’t needed any extra condiments on it, as simple as a burger can be but good enough to be eaten on its own. What went wrong though? A tiny part of my burger bun was crusty. Many would consider this a massive downfall but I only noticed it towards the end of my meal, so it didn’t really bother me much. Hot Lemon Tea (Rm4.80). Cappuccino (Rm5.80). A Tip: Give the drinks a pass. Both were complete misses. I would be more than happy to trade my cappuccino in with just a glass of plain iced water. Much were said about the burgers, but I’m giving the fries a miss. The salad was a clever and refreshing addition to a plate of virtually non-existent greens. However, the fries needs a little tweaking. Fries play an important role in a burger meal you know? WorthyBook have just released their Food Edition booklet! 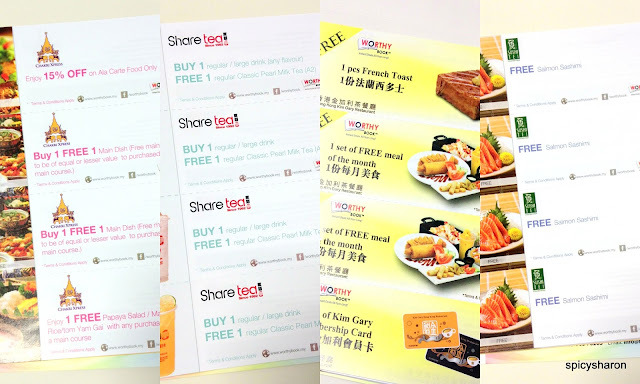 Featuring a total of 175 F&B vouchers, from bakeries like Bread Talk and Komugi Cafe to full-on Japanese Mains at Shogun and Sushi Tei and many more. Not forgetting the handful of Buy 1 Free 1 and further discounted vouchers also. There’s also page of my all time favourite Taiwanese street snack outlet – Shihlin! Savvy shoppers are welcome to check out the entire E-book link HERE. Macdonalds Jr. Country Grilled Chicken Burger C.E.O Burger @ Bandar Menjalara, Kepong (Non Halal) Crayon Burger, SS15 Subang Jaya Dining Out @ Gu Yue Tien, Chulan Square, Kuala Lumpur McD Jr. Country Grilled Chicken Burger is back? Johnny Rockets, The Curve Volks Burger @ Ampang, Kuala Lumpur Oh My Goodness! Giant burger at The Daily Grind, Bangsar Volcano Shabu Shabu @ Shaftsbury Square, Cyberjaya KFC Alaskan Fish Burger!